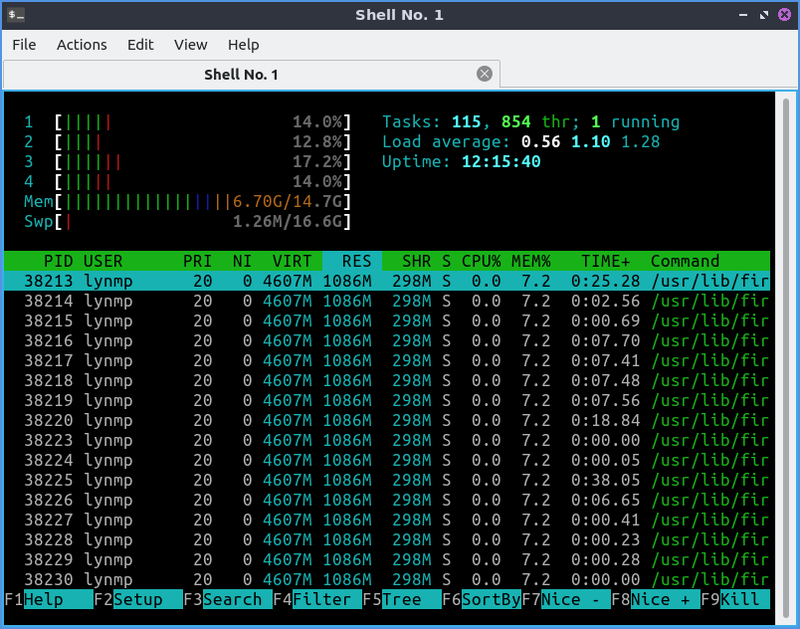 htop is an ncurses text interface task manager that can be controled by the keyboard. To view how much RAM is being used on your system is under Mem and then a [ number based on how many Gigabytes of memory. The Swp line lists how much swap is used. The numbers going down with a bar with a percentage next to them display usage on each of your cpu cores. Load average shows your system load over the past one five and fifteen minute is why there are three numbers see wikipedia load (computing) for more infmormation. Uptime shows how long your computer has been booted. After the bottom there is a green bar that says PID for the Process ID of a user, The user the process responds to, RES is how much RAM the process is currently using. CPU% shows how much as a percent of CPU time the process is using, mem% is a precent of the RAM your proess is using. Time shows how long the process has been running. Command shows the command line command of the process. To view any cut off part of the Command field press the Right Arrow to view the cut off area of the window. To move your window back to where it was press the Left Arrow key. To select the process below the currently selected one press Down Arrow to select the process below. To select the process above the currently selected one press Up Arrow to select the process above. To select the next group of processes on your screen press Page Down. To select the previous group of process on your screen press Page up. To choose the last process on your system press the End key. To choose the first process press the Home key. You can press F1 or ? to bring up a help dialog on htop. Pressing F3 or / lets you search for a particular process. To reverse sort order press Shift +I. Pressing F4 makes it so you can only see processes matching a certain partern. To get out of the view of your search for a pattern press the Escape key. Pressing F5 is what you press to veiw the processes in a tree. To get back to the default view press F5 again. Pressing F9 lets you kill a process with different signals to send to the process and 15 will terminate the process while 9 will Kill it. Lastly F10 will quit htop and return you to a terminal. To change how your process are sorted press F6 which will bring up your own menu to sort by by PID, USER, Priority, NICE, M_Size, M_Resident, M_Share, State, Percent_CPU, Percent_Mem, Time, or Command. F2 brings about a customizable settings on htop. The Meters brings up meters like CPU average. The Display Options has option for different ways to display in htop. The Colors tab brings up different color schemes for htop. Lubuntu ships with version 2.2.0 of htop.